The stated goal of this website is to present the ideas of quantum-geometry dynamics in an as clear and accessible way possible. But however well one understands the ideas and concepts one is presenting or how efficiently one communicates them, there is always some discrepancy between the author’s understanding of the subject and the reader’s understanding. One way to evaluate this discrepancy is to use questions from readers which illuminate areas that may need clarification. But questions play another important role. They test the author’s own understanding as well. And sometimes, the exchange of questions and answers between a reader and writer becomes a stimulating correspondence. This has certainly been the case with Mark Batten-Carew, with whom I have been corresponding for the past two years and who recently started to work on a computer simulation to test the QGD mechanisms of particle formation (the subject of a future article). In the process of creating a computer simulation of QGD, Mark has to fully understand the principles of the theory he wants to test and so has been asking questions. A lot of questions, so the most efficient way to answer his latest series of questions, I thought, would be to provide him with detailed examples. I was writing them down when I had an unexpected breakthrough (are breakthrough ever expected?). Quantum-geometry dynamics is built from first principles, which means that it explores the consequences of a set of axioms without any attempt to fit empirical data or agree with other theories. And only when the theory is sufficiently developed can it be used to describe, explain and predict phenomenon in the real world. Though it is tempting to check the constructs of a theory against observation in the early stage of development, it is a mistake that should be avoided at all cost. For example, one of the most striking consequence of QGD is that it led to the prediction that the Universe had evolved from an state in which only free preons(+) existed and were distributed evenly in quantum-geometrical space. This, I immediately realized, contradicted the Big Bang theory of the origin of the Universe. Of course, I couldn’t accept that. After all, there is ample evidence in support the Big Bang theory. If QGD was to be a theory that describes the real world, then it had to agree with the Big Bang theory. So my first impulse was to go back to the drawing board and see if I could fix QGD. I thought one of two things had happened; either the axiom set of QGD was inconsistent or incomplete, or I had made a mistake when drawing the consequences from the axiom set. After going over my work and finding neither problem, I tried to find a way to reconcile the QGD with the Big Bang theory and it was in the process of doing so that I realized that though QGD does not agree with the Big Bang theory, it nevertheless was agreed with observations. Not only was QGD consistent with the observations that support the Big Bang theory, but it agreed with observations that is counterevidence to it. Hence QGD’s predictions are in agreement with observational data, but not with the Big Bang’s interpretation of it. I had no choice but to accept that if QGD was correct, than the Universe had not evolved from a singularity, as the Big Band theory suggested, but from an isotropic state. From then on, I avoided trying to get QGD to agree with any theory that is based on a different set of axioms. That brings me to the present article. Based on first principles, QGD predicted the formation of a number of distinct dynamic structures from preons(+). And once the particle formation part of the theory was sufficiently developed, it was time to associate each different structure to an observed particle. So, based on their dynamical properties, I associated QGD distinct structures to the photon, the neutrino, the electron and positron. I thought that each QGD structure had been correctly associated to an observed particle until in I was in the middle of writing out the examples for Mark. I realized then that the structure I had associated to the photon should have been that of the neutrino and vice versa. Again, as I had done when QGD’s prediction came into conflict with the Big Band theory, my first reaction was that the new structure-particle association must be wrong. If the structure of photon and neutrino were as QGD predicted, then the mass of a photon would have to be greater than that of a neutrino (in QGD, the mass being the number of preons(+) a particle contains and since all particles are composed of preon(+), there are not massless particles). This contradicted with current theories which suggest that photons have no mass and neutrino, though not massless, would have a very small mass. I struggled with this until I remembered my experience with the Big Bang theory. And as I had done before, I compared the predicted properties of QGD neutrinos and photons with the observed properties of their real world counterparts. Suddenly, it all made sense. That the neutrinos interact so much more weakly with matter than photons do could easily be explained by the QGD prediction that neutrinos were much less massive than photons. I will briefly discuss some consequences of this breakthrough at the end of this article, but suffice to say that, had not taken time to answer Mark’s question, it is likely would have continued to work with an inconsistent assumption for who knows how long. Thanks Mark! Quantum-geometry dynamics, QGD for short, proposes that all matter is made of one single fundamental particle; the preon(+). This implies that all particles which current theories consider to be elementary must be composite. These include neutrinos, photons, electrons, positrons and even photons. We will explain here the mechanism at work in the formation of the simplest neutrino, photon and the electron or positron. 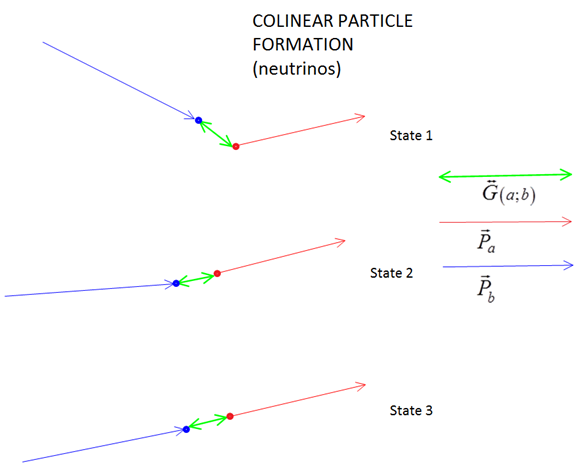 The above figure shows the different states leading to the formation of a neutrino. Here we have two preons(+) moving on collision course. From the position where they are close enough for the gravitational interaction to be binding, their trajectories will gradually align until they move as one particle along one trajectory. This dynamic structure, consisting of two preons(+) is the simplest neutrino possible, but neutrinos can be formed that have much greater number of preons(+). Also, since preons(+) always move at the fundamental speed , the distance between the component preons(+) will remain constant. 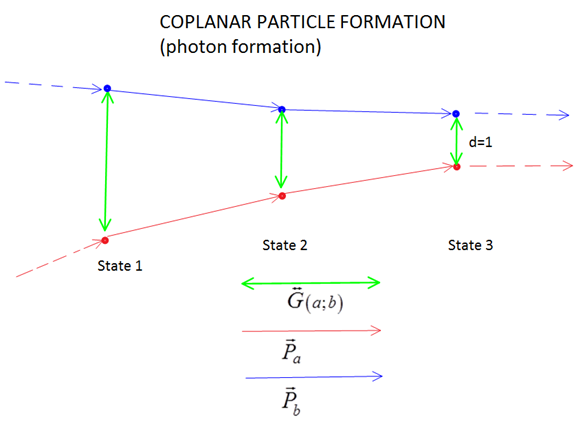 The figure above shows the formation of a particle from two coplanar preons(+) represented in blue and red. The blue and red dots represents transitional positions of two preons(+) as they come in close enough for the gravitational interaction between them to become binding. 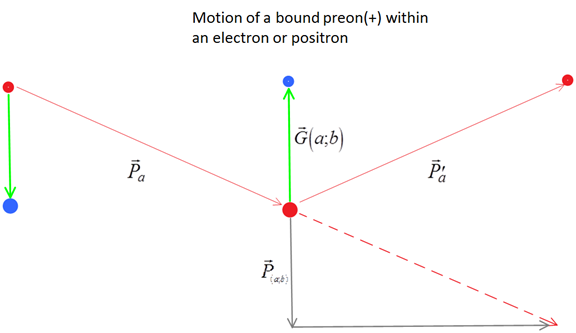 The red and blue arrows represent the momentum vectors of the red and blue preons(+). As per the definition of QGD, only the directions of momentum vectors of the two preons(+) changes while their magnitude, the fundamental constant , remains unchanged. 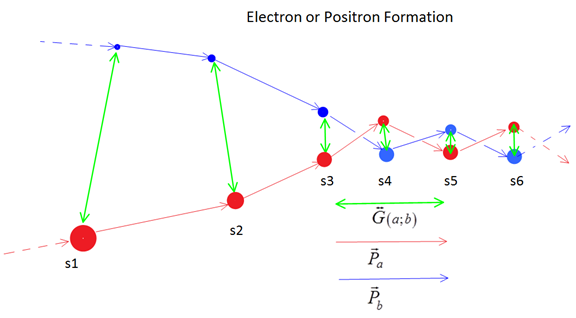 Within the photon structure, the two preons(+) move parallel to each other and since there is no component of the momentum vectors along the axis connecting the preons(+), the gravitational interaction will pull them closer until they reach a distance of exactly one leap( ). This raises one the question asked by Mark in his latest series of questions. What prevents the two preons(+) from occupying the same preon(-) ? The answer is that preon(-), the fundamental unit of space, corresponds exactly to what the fundamental unit of matter, the preon(+) can occupy. This is the basis of an exclusion principle by which only preon(+) can occupy a given preon(-) at any given state. So a leap to a preon(-) in direction of the gravitational interaction is forbidden when the preon(-) is occupied by another preon(+). Thus the gravitational interaction between will keep it two preons(+) bounded and moving on parallel trajectories. The exclusion principle also applies if the preons(+) in the above figure arrive at a distance but in this case, two outcomes are possible. One of preon(+) makes the leap to the middle preon(-) while other is forbidden by the exclusion principle. This will bring distance to . Though the outcome may be different, the photons having are indistinguishable those where . Note that the photon given in this example is the simplest photon, one the is made of only one pair of preons(+). More massive photons will have any number of such bounded pairs. Preons(+) on intersecting trajectories that are not coplanar will become bounded as shown in the figure below. In non-coplanar intersection, the momentum vectors of the preons(+) will have non-zero components along the axis of direction the gravitational interaction vector. This non-zero component will keep the component preons(+) at a distance at which , where is the magnitude of the projection of the momentum vector of vectors on the axis connecting and (see figure below). As explained above, it is important to remember that the momentum of a preon(+) is the fundamental constant so that only the direction of its momentum vector can change. So, if is the momentum vector of at a transitional position (position where its direction changes), then where the directional sum defined as . As we can see, the direction of is the same as that of the vector resulting from the ordinary vector sum while preserving the fundamental momentum of so that . Here, what keeps the preons(+) from one another is the component of along the axis that connects and , which opposes the gravitational interaction. So, since , for two preons at we have , it implies that , ( where is the magnitude of the p-gravity interaction acting between two preons(+) and is the magnitude of n-gravity interaction between two preons(-)). Also, from the above, the momentum of an electron can be understood as being the sum of the projections of the momentum vectors of its component preons(+) along electron’s axis of direction or . It follows that the speed of an electron or positron is always smaller than its energy unless it is accelerated to , in which case and its preons(+) moving parallel to each other . Thus, an electron or position accelerated to will have the same structure as the photon and since it is the helical motion of their component preons(+) which determines their physical properties, it follows that at speed , an electron or positron become a photon. We have mentioned in the article titled the Dark Matter Effect that the collective effect of free preons(+) over large regions of space give such regions produce the dark matter effect. A consequence of the structure of neutrinos described above is that though the dark matter effect is mainly due to free preons(+), neutrinos and photons (which form the CMBR) also contribute to the dark matter effect. The gravitational interaction between the “dark matter” of a region and an object is given by where , and are respectively the mass of free preons(+), neutrinos and the CMBR in . Note that dominant physics theories consider photons to be massless and neutrinos to have a negligible mass so that none them are taken into consideration to explain the dark matter effect. According to QGD, the CMBR is formed by free preons(+). As we have seen above, photons are still formed from free preons(+), but they can also be formed from neutrinos. So neutrino detection experiments may also be used to test QGD. Data from past and current neutrinos detection experiments may already provide support for the QGD model.